Six years ago I was in the kitchen, minding my own business, when a loud persistent knocking came at the front door. Opening it, I found a fellow from County Cork strapped to his trusty bicycle. It was pouring at the time and Mr Corkman looked like a drowned rat. Though it was only late May the wind and rain made it feel like the middle of Winter. "Would you mind," he said through chattering teeth, "if I camped in your back garden?" Though we had a large backyard I had never considered such a use for it. But on that occasion his request seemed perfectly reasonable. For you see, at the time in Eyeries the only alternative was to camp along the windswept seaside. Gusts would have instantly blown any normal tent to smithereens. I agreed instantly. Eventually it stopped raining and I watched with admiration as he set up his simple tent, helped him to push the bicycle into our wooden shed, and invited him to use the shower for a required wash. It was only later as we sat at the outdoor table in the early evening sun that his eyes roved out to the view beyond. "By God but it is stunning here," he said as he sipped his lager. "Really, you should consider letting other travelers camp here." My face must have registered surprise because his smile widened. "Why not?" he asked. "I've cycled all over the world. Many families turn their back gardens into campgrounds during the summer months." Suddenly intrigued I fixed him dinner over the grill. In exchange he offered his advice on this simple idea. One I embraced immediately. After his departure I had a small sign erected in front of the house which has hung there ever since: Solas Mor Tent Camping. Since my evening meal with a Cork stranger, we've been welcoming tent campers from all over the world. Campers are a different sort of breed, particularly those who come to this remote part of Ireland. It takes a bit of effort to get here, you see, which seems to separate the strong and brave from the other sorts. Many are hikers. Men, women, boys and girls of all ages troupe along the Beara Way, a long loop of hundreds of kilometers. They end up at our front door sometimes covered with dust and sweat, or soaking wet due to the endless showers. Others make it here as did our Corkman: by bicycle. They travel from God knows where across the country, venturing along narrow roads and across high mountain passes to gain access to Beara. Invariably they are exhausted. Others come by motorcycle or car. 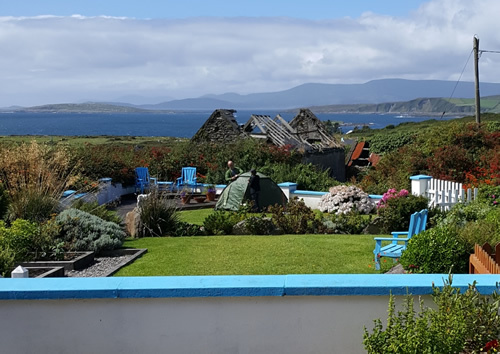 Or on a couple of occasions by boat either from across the Bay in County Kerry or from Castletownbere via Dursey Island. These seafarers tie up at the pier close by and hike up the hill to our home. Whichever way they come, they arrive looking for a rest and some peace and a bit of tender loving care. We're always glad to have them. We've had campers from all over the world: England, Wales, Scotland; Denmark, Holland, Norway. France, Spain, Germany, and Italy. Hikers and bikers have come from New Zealand, Australia, Israel and Japan. And of course we've had our fair share of visitors from the Americas: the United States, Canada and Mexico. When the arrive they speak to us sometimes in broken English or with no English at all. We'll point out where to go in the village: where to buy a loaf of bread and a bottle of wine; the two pubs down the street; Mass times on a Sunday. We'll open up our house to them - and often our hearts - and we'll listen to their stories for everyone has a story. This last weekend we had campers from Holland, France, Denmark, Norway and England. At night they sat out on the back deck and discussed the differences of their countries. They laughed in the darkness as they sought a common ground. We listened to them, did my She and Me, and heard them talk of the growing wariness in Central Europe and their horror of bloodshed and the concerns they have for their futures. Their laughter and sometimes sad chattering blended with the sounds of the surf on distant rocks, and they went to their sleeping bags at peace. At night we keep the window open in our bedroom, and could hear the soft whispering from their tents as they settled, and were somehow comforted knowing we were not alone. As I say everyone has a story and at times I marvel at the gifts these visitors - who often leave as friends - give us. Perhaps it is because we are strangers. Or maybe it is simply the peace to be found here. For whatever reasons many choose to share with us. And when they do, they often share deeply. Two stories come to mind. The first from an American. A man perhaps my age who, upon arrival, behaved abominably. He was angry and sad and complained bitterly about the rain and Ireland and as far as I could tell about almost anything he set his mind to. He complained so often that She was ready to throw him out. "If he says one more rotten thing about Ireland," She said, "he can sleep in a hedgerow for all I care. Would you please talk to him?" And so I did. I pointed out he had become rather a bully and as he took in my words I saw his face crumble and this Man of My Age was almost crying. "It's my brother," he admitted gravely and I saw his upset and knew there was more. So I got him a bottle of beer and we pulled up a couple of chairs and in the afternoon sun he quietly told me his brother had recently passed away, and I listened to his bitter, grave, grieving reminiscence and how much he loved his brother, and he didn't know any other way to handle his grief except with anger, which he knew was inexcusable. He apologized. He promised to do better, and I gently reminded him that Eyeries is a place of tranquility and healing, and that peace comes in on the wind and if you let it, it can cleanse your soul. When he left two days later he shook my hand and I saw the beginnings of acceptance in his eyes. "Thank you," he said and gave me an unexpected hug and I watched him walk away toward a future that I hope held even a bit of joy. Or another time, and this one a German lad of only eighteen. He was with a crowd of friends, all from the Fatherland, and his shock of blond hair and his interest in history got me asking questions. "Do you mind if I ask," and I paused for a moment, wondering if I was being inappropriate, "but did any of you have ancestors who fought in World War Two?" Most did, but it was the eighteen-year-old who at first went so very quiet. When I asked him why he told me. His grandfather had joined the Hitler Youth in the early days of the war, and had been inducted into the German Navy. He served aboard a U-Boat and had been responsible for hundreds if not thousands of Allied deaths, his grandson guessed. "Did he survive?" I asked. "Yes," the young lad said. "And I am so very ashamed of him because he was a warrior for Hitler." I was astonished at the lad's feelings. We talked more as the sky turned to twilight and I learned he rarely discussed the war or his grandfather and would never forgive his participation. "But why?" I countered and reminded him that many Germans fought for their country and therefore for Hitler. I did my best to point out that his grandfather fought in one of the most dangerous branches of the military. Over 70 percent of all German U-Boat crews died during the war. His grandfather survived. "I am older than you," I remember saying. "Forgive your grandfather. He was doing what he thought was his duty. He survived unlike so many others. Do not dismiss his memory. Rather, be proud. Remember, his survival meant he was there to raise children. And because of that I can share a beer with you in my back garden on a stunning summer's evening." The lad looked out at the sinking sun and his eyes were puzzled. "Promise me," I asked. "You no longer need to be ashamed of your Grandfather or what happened to Germany and its people in World War Two. Time has moved on. The world has forgiven. So must you." I saw him later in the pub. He became very drunk that night. But when he left the next day he solemnly shook my hand. "I will think of what you said," the young lad said. "Thank you so much for your hospitality - and your kindness for letting me talk." He did not realise: it was not I who was kind. It was him who had shared a story, a story he long held as a secret, that was the kindness. We have learned so many things, She and Me, from the people who come here to stay with us. We have learned the obvious, of course: people, no matter where they are from, are basically the same. We all experience the same emotions of love and laughter, shame and grief, that gives us a common bond and connection. We have also learned that everyone holds a story within them, often a narrative that could never be guessed at until they choose to share it with us. And when they do it is a great gift because they also give us their hearts. Finally, we have learned that Beara, and Eyeries in particular, provides the greatest gift of all. We watch as visitors come to us tired and often spiritually exhausted. We wonder as they leave, often fully refreshed. Often there are tears when they do. Yesterday, two French women left for home. One, the older of the two, was crying openly as she hugged my She and kissed her on the cheek three times as is her custom. "Merci," the French woman said. "If I could do it we would stay forever." Often, we wish our visitors could stay forever, too. That is simply wonderful Tom. Wow! I don't know how you do it. You and I are opposites, me being the recluse that I am. I'm glad you enjoy meeting new people. It makes the world a better place.